This sectional is exactly like the picture! It is light enough that I could handle it when I was moving it from the garage to the porch. The cocktail table is a little larger than expected and doesn't leave a lot of room to walk around when it is pulled in. Also, the plastic protective wrap on the metal legs was annoying to remove. BUT...it looks great and is perfect on the porch! I sprayed ScotchGuard on all the pillows and I am ready for company! I would definitely recommend this to a friend. Spend more time outside with your family and friends this year by adding this beautiful outdoor sofa sectional set to your deck or back lawn. The set features seating for 6-8 people and is made of durable materials that will withstand weather and sun damage. Arrived excellently packaged absolutely zero assembly. Unbox and unwrap that's about it. Comes with anti skid material for under flat cushions. Feels very well constructed. I bought a cheaper set too and I was shocked at the difference in quality. You won't be disappointed. Sorry it's not fully setup in the pic. We are still working on our deck. You can see the other set in the lower part of the pic as well. I bought this for my patio. It is stunning. It offered so much space. The gray cushions with the black wicker is beautiful. It locks together underneath so that the sectional stays together when someone sits on it. The cushions are nice. My only complaint is that they retain any rain....you have to turn them sideways to get the water to run out of them. Other than that it is a 5 star product. Great set, no assembly required. You just literally take it out of the box and put on your deck or patio. 4 boxes came all together, packaging was excellent. Have received a lot of compliments already and have spruced it up with decorative pillows. I kept waiting for a decent coupon from Overstock finally got one and couldn't be happier. I have done a lot of research on sectionals and glad I purchased this one. This couch set was simple to put together. 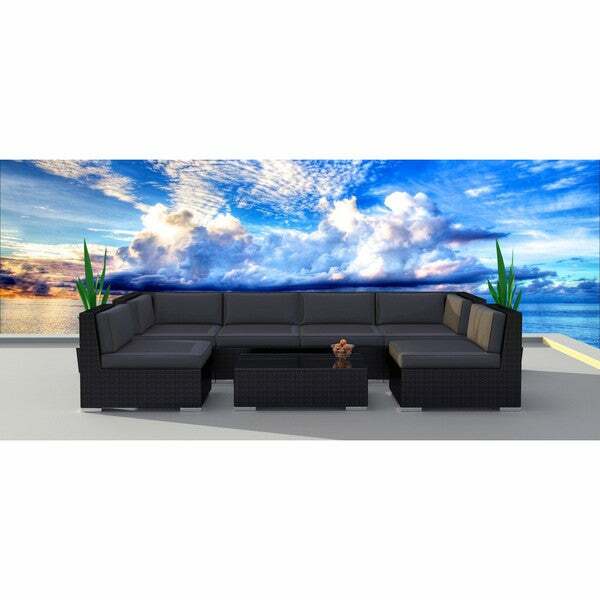 It looks beautiful and makes our guests feel cozy while sitting outside and enjoying the tv and the weather. Strong couch. Not low like others. Have has for over 5 months in the Florida sun and have not seen any fading. Easy to clean. Fast delivery. 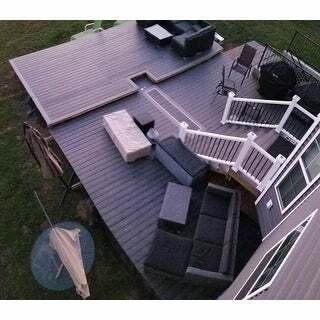 great set, we just put it together and out on our deck. The color is great and allows for any color accessory pillows you like. Very happy with purchase. Sturdy. Comfortable. Great quality for price. Comes assembled and ready for use. "What are the overall dimensions of this sectional and what pieces come with it?" The sectional is modular and can be arrange in various configuration, as it is shown in the photo, it measures 122"x 61". The set comes with 2 corner chairs, 4 middle chairs, and 1 table, Dimensions are as follows: corner chair - 33.5"w x 33.5"d x 27.5"h, middle chair- 27.5"w x 33.5"d x 27.5"h, coffee table - 37.5"w x 25.5"d x 12.0"h.
Great reviews! Great price! Love the dark neutral color that will go with anything! We liked the cool black on black look. "How many inches is there from the ground to the top of the seat? & is it 27.5" tall overall?" From the ground to the wicker is approximately 12 inches. The cushions are 4 inches thick, so it's a total seat height of 16 inches. The total height of the furniture is approximately 27.5 inches. These are considered low seating and will have a lounge feel. "Are there clips to hold the pieces of the sectional together?" Yes, this will come assembled.